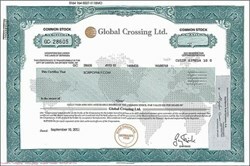 Beautifully engraved certificate from the Global Crossing, Ltd. . This historic document was printed by the Northern Banknote Company and has an ornate border around it with a vignette of a map of the world. This item has the printed signature of the company’s chairman ( Gary Winnick ). The certificate has not been folded and is in EF condition. These certificates have been very hard to find. Global Crossing Ltd., the telecom firm filed for bankruptcy on January 28, 2002 and is facing two federal investigations. The U.S. Securities and Exchange Commission is looking into whether Global Crossing used improper accounting methods to inflate income, the company has acknowledged, and there are reports that the Federal Bureau of Investigations is also probing the firm. The fact that Global Crossing is essentially an American company based off-shore in Bermuda may also raise some suspicions of chicanery, said Robert Rosenberg, president of the Insight Research Corp., a telecom consultancy based in Parsippany, N.J. Global Crossing's original business plan was to lay optical fiber under the oceans to link continents and sell capacity to other networks. Global Crossing has proposed to a bankruptcy court in New York that some $12.4 billion in debt be forgiven, and it has agreed to a buyout by two Asian telecommunications firms, Hong Kong's Hutchison Whampoa Ltd. and Singapore Technologies Telemedia Ltd. Under the proposal before the court the two Asian companies would emerge with a 79 percent stake in Global Crossing's fiber network while creditors would receive the remaining 21 percent as well as some cash and financial notes. A former Global Crossing vice president of finance, Roy Olofson alleged in a letter dated Aug. 6, 2001, that the firm used improper accounting practices to inflate revenues. The company disputes that, but said it will launch an independent investigation using an auditor other than Chicago-based Andersen, which is its regular auditing firm, to look into the allegations. Reuters news service reported that federal law enforcement officials said the FBI is looking into Global Crossing's affairs, although an FBI spokesman said the agency doesn't comment on investigations. Telecom industry experts were surprised to hear of FBI interest in the matter. Global Crossing Ltd. (NYSE: GX) provides integrated telecommunications solutions over the world's most extensive global IP-based fiber-optic network, which will have over 100,000 route miles, reaching 27 countries and more than 200 major cities. Global Crossing serves many of the world's largest corporations, providing a full range of managed data and voice products and services. Global Crossing operates throughout the Americas, Europe, and the Asia/Pacific region, and provides services in Asia through its subsidiary, Asia Global Crossing.